Did you know that May is National Mediterranean Diet month? I have been a fan of this eating plan for years because I love the fresh approach to feeding my family delicious whole food meals. Therefore, I had a blast recreating some of the Zoës Mediterranean-inspired Fresh Take recipes courtesy of Zoës Kitchen! Zoës Kitchen is a wonderful restaurant with a full menu of Mediterranean inspired meals. Some of their specialties include a Fresh Chicken Salad with a Seasonal Fruit Plate, Greek Chicken Pita, Pimento Cheese Classic Sandwich and Steak Kabobs. There are also delicious side items such as hummus, braised white beans, fresh pasta salad, marinated slaw and potato salad. For busy families Zoës Kitchen even offers complete dinner ideas for four people that is the perfect healthier meal option for takeout. You are definitely not going to want to miss out on Yaya’s Hand-Made Chocolate Cake for a rich, decadent dessert! 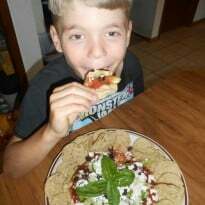 Our family favorite Zoës Mediterranean-inspired Fresh Take recipe is the Mediterranean Layer Dip which is a wonderful snack, lunch, appetizer or side dish. My children LOVED this recipe and gobbled it all up before I even had a chance to eat my share so we actually made this again by popular request the next day. 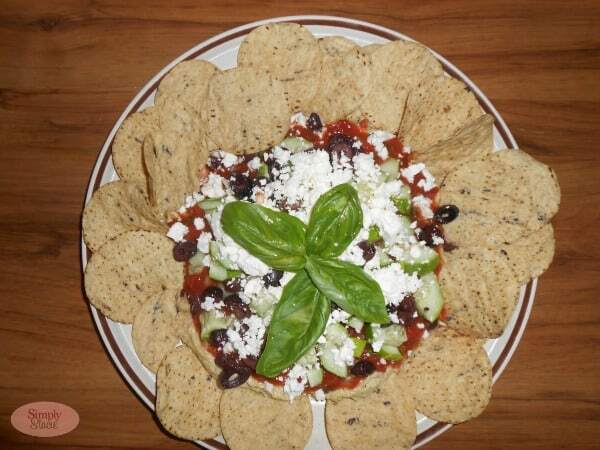 It includes creamy hummus, juicy tomatoes, diced cucumbers and basil from our vegetable garden, crumbled feta and Kalamata olives served with delicious whole grain chips. 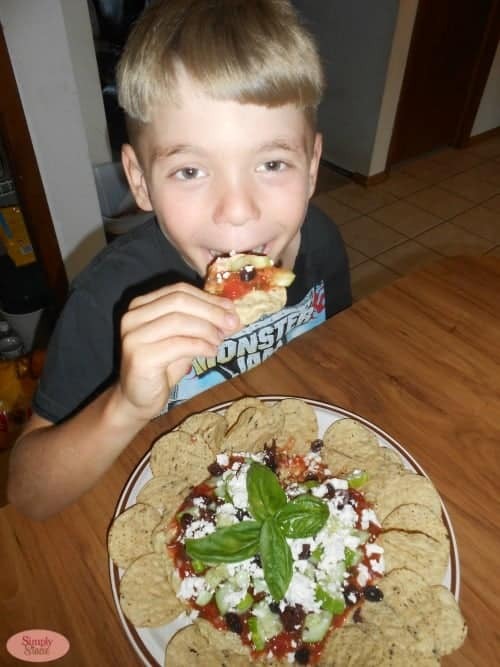 I was thrilled that my children raved about this recipe so much and that they enjoyed eating something that is so healthy and good for them. I will definitely make this recipe again and also plan to serve it at an upcoming dinner party as a pre-dinner appetizer for my guests. You can make this dish at home easily by picking up a take home tub of Zoës Hummus and then add you own fresh ingredients. You can also pick up a container of Zoës Pimento Cheese and may I suggest making another of our family favorites, the Zoes Kitchen Pimento Cheese & Spice of Life Burger that is absolutely delicious. You can check out all of the delicious Zoës recipes available for free at Zoës Kitchen. As a mom who takes pride in serving my family fresh, tasty foods, I am delighted to introduce you to Zoës Kitchen which makes healthy and delicious food a great option for even busy families. A delicious snack or easy lunch! Spread hummus across bottom of shallow bowl or dish. Layer with diced tomatoes, cucumbers, olives. Sprinkle with crumbled feta and garnish with fresh basil. Serve with pita chips. This looks amazing, and I’m always looking for new recipes….I don’t know if I’ve ever even tried Mediterranean food, but I’m willing! These recipes sound delicious and something my whole family would love. I definitely will be making the dip. It looks and sounds so refreshing. Yumm! What a healthy and delicious sounding recipe! Mediterranean food is so good for you! I havent eaten many Mediterranean foods before. But this is something I would like . It would be nice for a party dish too. I like exploring different foods and I also collect cookbooks. That dip looks and sound amazing! Mediterranean food is very healthy and a very good diet. We love hummus so much in this family that we have it often. Your dips sound awesome, thanks for the recipe. What a refreshing meal for a summer’s evening. We tend to eat much lighter with lots of fruits and veggies in the summer. I would love this! Thanks for sharing. That dip looks amazing! I love mediterranean food and it is so healthy too! I’ll have to pass on this as I don’t like feta cheese. oh my goodness, this looks so wonderful. I am going to have to make this. I love Mediterranean cooking! We have been trying to eat fresh for awhile now, so this will be one of our new go-to recipes! Mmmm This dip looks yummy! Though for personal preference I would leave out the black olives 🙂 Thanks! I love Mediterranean cuisine! The dip looks so good and I’m going to check out the other recipes, too! Mmmm!!! I have to share these recipes with my friend too. She loves both humus and pimento cheese. Thanks! I, too, am a fan of the Mediterranean diet. This looks so great…and kid friendly, too, given the look on your son’s face! How creative and different! Mediterranean diets are very in right now. Many health benefits including weight loss and adding basic nutrients. We love dip and this innovative recipe would jazz up our normal snack. This looks so good! Easy to make too which I like!